Submitted by Lindsay Perigo on Sun, 2018-06-24 05:58. Submitted by Kyrel Zantonavitch on Sun, 2018-06-17 17:59. Well, four days have passed and Tommy evidently hasn't been murdered yet. But the whole situation is an outrage. It seems like a deliberate parody of reality. What could be more raw evil? How could Muslim Civilization (sic) more purely triumph over Western Civilization (sic)? Submitted by Kyrel Zantonavitch on Sun, 2018-06-17 18:02. Richard and Greg -- As I've stated many times before, I massively support Pamela Geller and Tommy Robinson (and Richard Spencer, Jordan Peterson, Stephen Molyneux, etc.). For all their philosophical and political flaws and weaknesses, they're what I call cultural warriors for Western Civilization. But I think there is immense power in philosophy. If they had a better understanding of (what I call) up-wing liberalism, they'd be maybe five or fifty times as powerful. Submitted by gregster on Sat, 2018-06-16 09:47. You described the situation very well for Kyrel. Submitted by Richard Wiig on Fri, 2018-06-15 19:36. I don't think his philosophy matters greatly, Kyrel, not unless you're wanting him to be a philosopher-king who leads everyone to rationality and freedom. He, and Pamela Geller, might be lacking by varying degrees in rational philosophy, but I think it is their sense of life, in the general sense, that really matters. They are reactive in the face of the civilisational threat of Islam. If it wasn't for the spread of Islam and the evil it brings, then you'd perhaps never hear of Tommy Robinson or Pamela Geller. I don't know what Tommy's politics is. Under normal circumstances he might be a traditional labour voter. But it doesn't really matter. He recognises the civilisational threat, and he's an ally in the fight against it. Regardless of any flaws there might be in his worldview, he is doing more for liberty than any oblefitivist or leftitarian. He deserves support. And I'm pretty sure he's not a racist. There's been absolutely no evidence to support that claim. The EDL even was not a racist organisation, having members from across many races, and even gay and lesbian supporters. The MSM cannot be trusted. Submitted by Lindsay Perigo on Fri, 2018-06-15 02:40. If the new Muslim Home Secretary is claiming to be a fan of Ayn Rand he's an Obleftivist. Perhaps we are seeing a piece of the jigsaw puzzle of why Yawon is such an Islamapologist. I've said previously that Obleftivists do not proceed in good faith; they are evil. The man who moved Tommy to this new prison is evil. Submitted by Olivia on Thu, 2018-06-14 07:10.
the new Home Secretary, Sajid Javid, says his hero is Ayn Rand. Javid's hero apart from Thatcher is Ayn Rand – he recounted once that he regularly rereads the courtroom scene from her novel The Fountainhead, telling The Spectator he admired its description of “the power of the individual … sticking up for your beliefs, against popular opinion”. At a 'Crossbench Film Society' event, Javid chose to introduce The Fountainhead (film) and described the profound effect it had on him, having watched it as a 12-year-old. He claims that though from a Muslim heritage, he does not practice any religion. Let us hope he has not been influence also by Yawon. Submitted by Olivia on Thu, 2018-06-14 04:31. New Muslim Home Secretary, the same one who had that piece of Jihadist Filth Choudray released early! Submitted by Lindsay Perigo on Thu, 2018-06-14 03:55. Britonistan has a new Home Secretary, appointed by the unspeakable Theresa May. He's a Muslim. He has just authorised the transfer of Tommy to a jail comprising 70% Islamosavages. Submitted by Lindsay Perigo on Tue, 2018-06-12 22:50. By way of context, people ask us why the "exciting racial disharmony" provisions of the Human Rights Act apply to some groups and not others. We are also asked why people who complain to the commission under these provisions are offered mediation but are not able to obtain a decision or finding from us about the substance of their complaint. Submitted by Lindsay Perigo on Mon, 2018-06-11 06:46. "Do you want be Britain or Saudi Arabia?" Already settled, unfortunately. Submitted by Kyrel Zantonavitch on Sun, 2018-06-10 22:06. Richard -- I mostly just did a quick Wikipedia search on Tommy Robinson two weeks ago. That publication is pretty post-modernist. Maybe he's not much of a thug or nut after all. Not a racist either, I hope. A few days ago I read that his conviction on financial fraud may have also been trumped-up. What counts, ultimately, about this new world figure and symbol is this: What is his philosophy? I hope he turns out to be a semi-liberal cultural warrior. He won't count for much if he's a non-entity conservative or a major intellectual ignoramus. Even Pamela Geller is weak because she fundamentally damns "jihadism" and not Islam. She also champions sacrificial religious conservatism -- exactly like the jihadis. Submitted by Lindsay Perigo on Wed, 2018-06-06 21:20. In case you managed to miss it on other threads! Submitted by Lindsay Perigo on Sun, 2018-06-03 06:03. Other journalists filming the same trial. Submitted by Richard Wiig on Sat, 2018-06-02 10:53. Submitted by Lindsay Perigo on Thu, 2018-05-31 09:02. Submitted by Lindsay Perigo on Wed, 2018-05-30 05:41. Submitted by Lindsay Perigo on Tue, 2018-05-29 04:05. Submitted by Jmaurone on Tue, 2018-05-29 03:28. I love this video. Why? It's a welcome change from the usual spoiled, hysterical women/soy-boy screeching found in Antifa and other lefty protests. This is the sound of men (and women!) with a purpose. But just as important, it's the sound of MEN. Men who refuse to bow down, to be silent in the face of injustice, and who reject the call of feminists, soyboys, etc who do NOT WANT THEM to be men. This is a rejection of the accusation of "toxic masculinity." And for a most important cause: freedom of speech. Submitted by Jmaurone on Tue, 2018-05-29 03:26. Submitted by Olivia on Tue, 2018-05-29 01:58.
from the Free Tommy Robinson Silent Vigil outside the British Consulate in Auckland this morning. We were a small group, but spent lots of time in conversation with people walking past and inquiring into what we were about. Many people here haven't heard of Tommy, but they have now. Supportive drivers-by tooted their horns in solidarity and so did pedestrians who are in the know. NZ, so far, because it has been spared any terrorist attacks, doesn't seem to take these matters seriously; the support we received for our sit-in today came mostly from those who are from the UK or South Africa. Submitted by Lindsay Perigo on Tue, 2018-05-29 01:30. 1 hr 06 mins in. He's in London, and evidently not paying attention. "Who's Tommy Robinson and why was he arrested?" Someone then enlightens him, and he recites our standard line about how there shouldn't be "hate speech" etc. Let's see what he has to say when he's up to speed. Submitted by Jmaurone on Mon, 2018-05-28 21:58. "Soviet-style disappearance". "Perfidious Albion", indeed. The British Isles: Now part of The Gulag Archipelago. Despite intending it for the Thatcher years, THIS is the England Alan Moore was warning about in V for Vendetta. Submitted by Jmaurone on Mon, 2018-05-28 20:39. 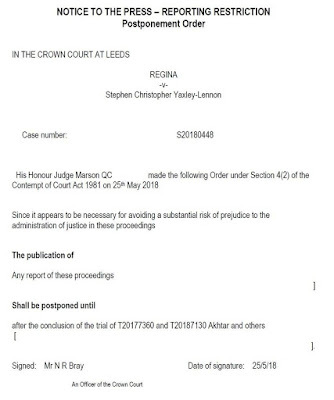 ""Since it appears to be necessary for avoiding a substantial risk of prejudice to the administration of justice in these proceedings: The publication of any report of these proceedings shall be postponed until after the conclusion of the trial..."
Submitted by Jmaurone on Mon, 2018-05-28 15:53. While we in the U.S. are dealing with back-door censorship, while debating the definition of censorship as state-dictated vs. the right of property owners to discriminate, the UK is implementing true-blue, full-blown censorship, as we speak. One can debate the benefits and hazards of having someone like Tommy Robinson as the focal point of a liberty movement until they're blue in the face. But when press and others are PROHIBITED from reporting on, or even discussing the case, there is no question, no debate, that the UK government has crossed the line into dictatorship. "There are four characteristics which brand a country unmistakably as a dictatorship: one-party rule—executions without trial or with a mock trial, for political offenses—the nationalization or expropriation of private property—and censorship. A country guilty of these outrages forfeits any moral prerogatives, any claim to national rights or sovereignty, and becomes an outlaw." Britain is there. What will the ARI say about this? I've personally already written them off as useless, at best, and downright complicit, at worst. "For all he's really worth to Objectivism today, That Woman might as well never have devoted a single line to Ragnar Danneskjold." But if there's ANY chance of redemption, it's now or never. Otherwise, let them return to dust. "Dead things, such as the Banner..."
Submitted by Bruno on Mon, 2018-05-28 12:13. Tommy Robinson is now the West incarnate. His fate is our fate. We are Tommy Robinson. This is the fight for our Civilisation. Britons are at a crossroads. Never or Ever will be slaves? Obleftivist filth is silent, or worse. They are with the enemy. Submitted by Richard Wiig on Mon, 2018-05-28 08:56. He was a soccer hooligan in his past, Kyrel. He talks openly about that and about the world that he grew up in. One thing he isn't, though, is a nut. Passionate about the liberties that too many take for granted, but not a nut. He realises the ultimate consequences of the advance of Islam if it isn't stopped. The leftists have used his past against him to great effect. Anyone who cares about justice though will do their own investigating and make up their own mind. That of course leaves Obleftivists and Leftitarians out. Submitted by Lindsay Perigo on Mon, 2018-05-28 07:04. What will make the people rise up out of their armchairs and realise that hashtags and candles and politicians aren’t fixing the problem? I was still wondering what the tipping point would be until Saturday, 26th May, 2018, when I went to a Free Tommy rally outside of 10 Downing Street. Tommy Robinson is the answer to my question. Tommy Robinson’s well-being will be the tipping point in the UK for authorities, police and politicians, and if they’re smart they’ll take notice of this. The energy and the passion at Downing Street and the anger was palpable at the doorstep of our current MP’s offices. There was a line-up of about 5 right-leaning MPs and others lined up to address the crowd and put forward their own opinions and inform and motivate us. But the crowd was not in a mood to listen, not even to people who are on our side. The consensus seemed to be that enough talking had been done. It was now time for action, and we had all the motivation that we needed – Tommy’s well-being – and we wanted the parliamentarians to be sure they heard us, so we shouted as loud as we could. Submitted by Lindsay Perigo on Mon, 2018-05-28 06:28. Submitted by Lindsay Perigo on Mon, 2018-05-28 05:37. The Tories and Labour are both now stooges of Islamosavagery, so Britonistan is now effectively a one-party state. And Tommy had no trial for what was a political offence. He hasn't been executed, but has been placed in confinement with Islamosavages with a view to his being killed. Of what do these facts remind you? Submitted by Lindsay Perigo on Mon, 2018-05-28 05:22. Submitted by Lindsay Perigo on Mon, 2018-05-28 04:55. 2. The extraordinary deep state defense of Hillary Clinton, combined with the systematic avoidance of exposing and dealing with her illegal behaviors while protecting her staff members when they support and participate in her illegality, is beyond anything we have seen in American history. If you have any illusions about the Justice Department’s objectivity, keep in mind that employees of this department gave 97 percent of their 2016 campaign donations to Hillary Clinton – while the department was supposedly investigating her for illegally using a private email server to send and receive classified information as secretary of state. With each passing week, we are learning more about the extraordinary abuses of power designed to undermine President Trump and punish his supporters (a direct contrast to the treatment of Clinton and her staff). The aggressive abuse of power has led both Alan Dershowitz and former Clinton adviser Mark Penn to warn that limitless police power is a danger to all of us. 4. The scandal of the deep state resistance to accountability and transparency has also been astounding. As a career deep state member, Deputy Attorney General Rod Rosenstein has consistently resisted inquiries by Congress. Documents requested by the Senate Judiciary Committee were heavily redacted for supposed national security reasons – which turned out to have nothing to do with national security (including the fact that the FBI had spent $70,000 on a conference table). Meanwhile, more than 1 million documents were withheld from the House Judiciary Committee for so long that the committee had to issue a subpoena. The reason for this deep state resistance is simple. Transparency is going to get a lot of people in trouble – and it goes to the very top. When Lisa Page wrote Peter Strzok in September 2016, “POTUS wants to know everything,” there is good reason to believe President Obama was the one she was referring to as POTUS. If President Obama wanted to know everything, given the way his White House worked, it is very likely his senior adviser Valerie Jarrett knew everything. The more we learn, the bigger the scandal web gets. Submitted by Lindsay Perigo on Sun, 2018-05-27 22:08. "We shall defend our island, whatever the cost may be. We shall fight on the beaches, we shall fight on the landing grounds, we shall fight in the fields and in the streets, we shall fight in the hills; we shall never surrender." Not Hitler, but the government of Britonistan itself that must now be smashed. #If your blood's not boiling you're a waste of space. Submitted by Kyrel Zantonavitch on Sun, 2018-05-27 14:28. An Iranian lady takes note of the recent imprisonment. Submitted by Kyrel Zantonavitch on Sun, 2018-05-27 14:00. I never heard of Tommy Robinson until yesterday. But I just researched him a bit, and he does seem to be a bit of a thug and nut. Robinson evidently likes to get into fist-fights at soccer matches and meetings with his fellow radicals, plus he's evidently guilty of fairly serious financial fraud. So he's served a lot of multi-month jail terms in his time. Robinson also seems to be a gadfly and trouble-maker who loves the limelight. Still, his only real crime is being anti-Muslim -- which everyone decent should be. Robinson is fairly famous in Britain and he fights against the evil of Islam in a flamboyant manner. This combination landed him in jail. But he's not actually guilty of anything except exercising free speech. The evil, fascist, tyrannical, Orwellian gov't and intelligentsia of Great Britain hates that. They uphold the nightmare social ideals of political correctness, multiculturalism, diversity, inclusion, sensitivity, minority supremacism, etc. So for them criticizing Islam is a hideous Thought Crime which they can not allow. Big Brother is evidently very submissive to Islam in Britain these days. Truly sick. An account of todays protest. Submitted by Richard Wiig on Sun, 2018-05-27 09:36. Submitted by Lindsay Perigo on Sun, 2018-05-27 06:56. Anything from ARISIS yet? Still just Nosering and her whining on behalf of The Filth? Submitted by Lindsay Perigo on Sun, 2018-05-27 06:18. I just signed and chipped in. Submitted by Olivia on Sun, 2018-05-27 05:59. Here's the petition to sign - we'll see what good, if any, it may do. It already has over 170,000 signatures. Submitted by Lindsay Perigo on Sun, 2018-05-27 02:36. Submitted by Jmaurone on Sat, 2018-05-26 23:49. "On Twitter, the Nosering (aka Amy Peikoff) is going on about the horror of invader families being separated by Immigration Enforcement after illegally crossing the American border." "Trump calls for Democrats to end ‘horrible law’ that he says separates children from parents at border"
Submitted by Grant Jones on Sat, 2018-05-26 22:12. On Twitter, the Nosering (aka Amy Peikoff) is going on about the horror of invader families being separated by Immigration Enforcement after illegally crossing the American border. But, of course, no comment on Tommy Robinson's persecution and the government imposed media blackout on the story. Of course, on the immigrant issue, Social Justice Warriors always lie. The invader families can go back to where they belong together. Or, they could have chosen not to break the law in the first place. What other lawbreakers get to remain incarcerated as a family unit? According to the Nosering, these particular criminals enjoy special privileges by "virtue" of not being Americans. Submitted by Kyrel Zantonavitch on Sat, 2018-05-26 13:06. The Tommy Robinson incident leaves me breathless and in stark disbelief. He now seems to be the center of liberty and civilization on this planet. His fate is our fate.